Get a taste of Turf War! 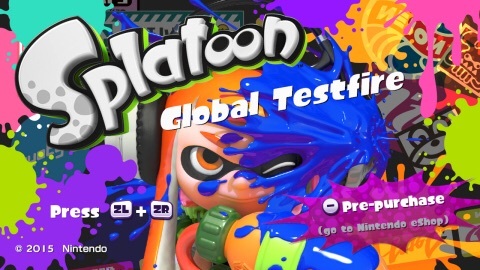 To celebrate the upcoming launch of the Splatoon game on May 29, we’re offering an early chance to get your feet wet (with ink) in the Splatoon Global Testfire! Download the free demo, jump online and fight it out in fast and furious four-on-four Turf War battles. This global event will only be active during a few short time periods between May 8 and May 9. Don’t miss this early chance to get inked! In addition, to help fans start playing as soon as possible, we’re offering a new buying option that lets you pre-load the game before it launches. Here’s how it works: Starting today, if you pre-purchase the game in the Nintendo eShop on Wii U, it will pre-load the game to your system so you’ll be able to play after a small game update when it launches on May 29. Be one of the first to play! High Strangeness is the first of its kind – a deftly blended hybrid of 8- and 16-bit games. Drawing inspiration from some of the timeless RPG and adventure classics that hailed from both generations, players take on the role of Boyd, who along with his trusty (yet sarcastic) feline friend, traverses between two worlds in order to solve a multi-layered mystery. 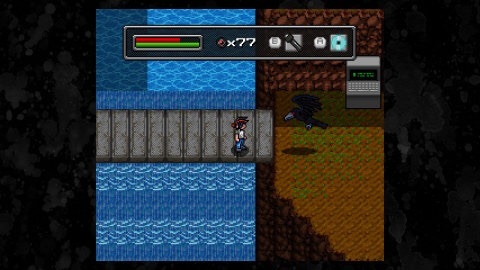 The game’s core ability is to switch between 8- and 16-bit worlds to solve puzzles and explore the universe. Click here to view a trailer for the game. Mega Man & Bass – The fans have spoken, and the winner of the poll to determine the first game in Mega May is … Mega Man & Bass! Choose either Mega Man or Bass to battle against the latest menace in town. Mega Man can power-charge his cannon, while Bass can rapid-fire in multiple directions. Each with his own unique abilities, canine companions and motivations to fight, Mega Man and Bass set out to stop King and his robot army. Metal Marines – As the Commander of the allied Colonies, you must defeat the imperial forces in a series of battles. In this Super NES real-time strategy game, lead the Metal Marines on intense raids against Zorgeuf and his empire as you build strong defenses, launch devastating missile strikes and ultimately decide the fate of the nations. – You’re stuck in a world that has been invaded and is on the brink of non-existence. At the same time, you and your friends have gained the power to fight against fate. The countdown begins: Will you be able to save the future of mankind? Shin Megami Tensei: Devil Survivor 2: Record Breaker is now available exclusively on Nintendo 3DS. As a bonus, download two free pieces of DLC with more coming soon to help out with your fight. Click here to view a trailer for the game. – To help fans start playing as soon as possible, starting today, we’re offering a new buying option that lets you pre-load the game before it launches. Here’s how it works: If you pre-purchase the game in the Nintendo eShop on Nintendo 3DS, it will pre-load the game. That means you’ll be able to play after a small game update when it launches! As an added bonus, those who purchase the game in the Nintendo eShop between now and 11:59 p.m. PT on May 31 will receive a free Immortal Dragon Relic Present Code! The relic will be available when the game launches. In the meantime, don’t forget to download the free special demo that is now available in the Nintendo eShop on Nintendo 3DS. You can try out the Puzzle & Dragons: Super Mario Bros. Edition game before it launches on May 22. SteamWorld Dig on Wii U and Nintendo 3DS is up to 55 percent off (reduced to $4.49 each) until 8:59 a.m. PT on May 21. Angry Birds Star Wars on Wii U and Nintendo 3DS is 50 percent off until 8:59 a.m. PT on May 11. Trine Series Fan Discount – Trine Enchanted Edition and Trine 2: Director’s Cut are each up to 50 percent off until 8:59 a.m. PT on May 28. As a bonus, if you own either game, you’ll receive an additional 20 percent off of the other game during the sale period. Puddle is 75 percent off (reduced from $7.99 to $1.99) until 8:59 a.m. PT on May 14. Dolphin Up is 25 percent off (reduced from $3.99 to $2.99) until 8:59 a.m. PT on May 14. GravBlocks+ is 49 percent off (reduced from $4.99 to $2.50) until 8:59 a.m. PT on May 17. Brunch Panic, Kami and Sweet Memories – Blackjack from Circle Entertainment are on sale until 8:59 a.m. PT on May 28. Persona Q: Shadow of the Labyrinth is 20 percent off (reduced from $49.99 to $39.99) from 9 a.m. PT on May 11 until 8:59 a.m. PT on May 25. Aqua Moto Racing 3D is 50 percent off (reduced from $7.99 to $3.99) until 8:59 a.m. PT on May 14. Zombie Panic in Wonderland DX is 37 percent off (reduced from $8 to $4.99) beginning at 9 a.m. PT on May 9 until 8:59 a.m. PT on June 9. Hello Kitty Kruisers is reduced to $9.99 (from $19.95) beginning at 9 a.m. PT on May 8. Balloon Pop Remix, Johnny Hotshot, Johnny Impossible and Johnny Kung Fu are reduced to $2.99 (from $4.99) beginning at 9 a.m. PT on May 5. Samurai Sword Destiny and Zombie Slayer Diox are reduced to $2.99 (from $5.99) beginning at 9 a.m. PT on May 5. Disney Frozen: Olaf’s Quest is reduced to $19.99 (from $29.99) beginning at 9 a.m. PT on May 5. Scarygirl Illustration Kit is reduced to $2.99 (from $5.99) beginning at 9 a.m. PT on May 7. Tangram Attack is reduced to $1.49 (from $2.99) beginning at 9 a.m. PT on May 7. Code Name: S.T.E.A.M. “Watt’s Up?” Tournament – See how your Code Name: S.T.E.A.M. squad stacks up online in Nintendo’s Public Tournaments. Top players earn unique titles that are visible online and earn major bragging rights with their friends and around the world. The new “Watt’s Up?” tournament runs from May 8 to May 10. Opt in via the SpotPass feature for notifications on future tournaments, and click herefor more information about multiplayer tournaments. Good luck, agents!